Anatomy of the extrahepatic bile ducts; drawing shows the liver, right and left hepatic ducts, gallbladder, cystic duct, common hepatic duct (hilum region), common bile duct (distal region), extrahepatic bile duct, pancreas, and small intestine. An inset shows the liver, bile ducts, and gallbladder. 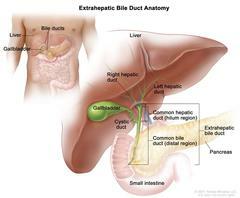 Anatomy of the extrahepatic bile duct.